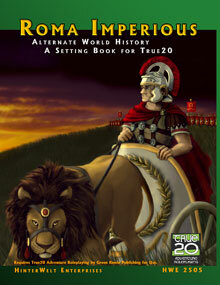 Roma Imperious True20 is the result of fans of the Roma Imperious setting calling for translations to their favorite systems. True20 had the most requests and we, at HinterWelt, knew it would be a great fit. Many of the design goals in True20 and our own Iridium System match very closely. With that in mind, we employed Matthew Kaiser to help with the conversion. We hope you will enjoy the results as much as we did writing and assembling the book. If you own Rome Imperious Iridium then you will have about 1/2 of this book already. However, if you wish to run a True20 campaign in a bigger than life world dominated by a Roman Empire that wields magic in one hand and Imperial force in the other, this book is for you. This is an exemplary True20 source book for a Roman or fantasy setting.